Packaging plays a crucial role in selling cosmetics. As both a vehicle to reinforce the value of the brand and a means to protect and organize products, cosmetics require high-quality thermformed packaging in quick turn-times at competitive pricing. Dordan has 60-years experience designing and thermoforming cosmetics packaging solutions like plastic clamshells, blisters, and trays. Dordan offers cosmetics packaging made from recycled, colored, and flocked material. ISO 9001:20015 certified for the design, manufacture, and distribution of custom thermoformed packaging, Dordan offers full-service cosmetics packaging design, tooling, and production in-house. This integration between design and production grants scheduling flexibility and offers intelligent quality control as the same team of engineers that develop the cosmetics package design also produce the thermoform tooling on which it's formed. Dordan understands the priorities of cosmetics companies and works to make the packaging procurement, design, production, and distribution as easy and efficient as possible. Our Quality Policy is to ensure complete customer satisfaction through the delivery of defect-free products and services. This means that Dordan is structured, from its design through production, to provide high-quality thermoformed packaging that meets its customers' expectations. 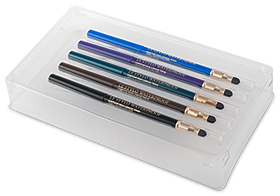 Plastic insert trays protect, display, and organize cosmetics inside an outer paperboard or clear-fold carton, sleeve, or setup box. Thermoformed POP display trays showcase cosmetics at the point of sale, allowing for seasonal and/or promotional marketing that facilitates consumer interaction with the product. Plastic clamshells securely display cosmetics at retail. Plastic blisters display and protect small and lightweight cosmetics at retail.